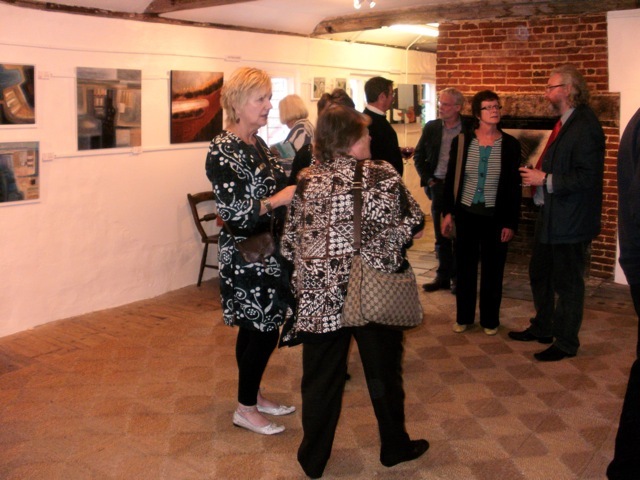 Friday saw the Preview of the ‘Six Abstract Artists’ exhibition at the Halesworth Gallery in Suffolk, which I am delighted to be a part of. Artists Jazz Green, Geraldine Carratu, John Midgley, Anthea Eames, Joan Hickson and myself have come together to show a wide range of styles and work, ranging from abstract to semi-abstract, and includes geometric, textured, bold, subtle, vibrant, lively and flowing pieces. It was an enjoyable evening with a great buzz about it as a good number of people turned out to view the work and talk to the artists. 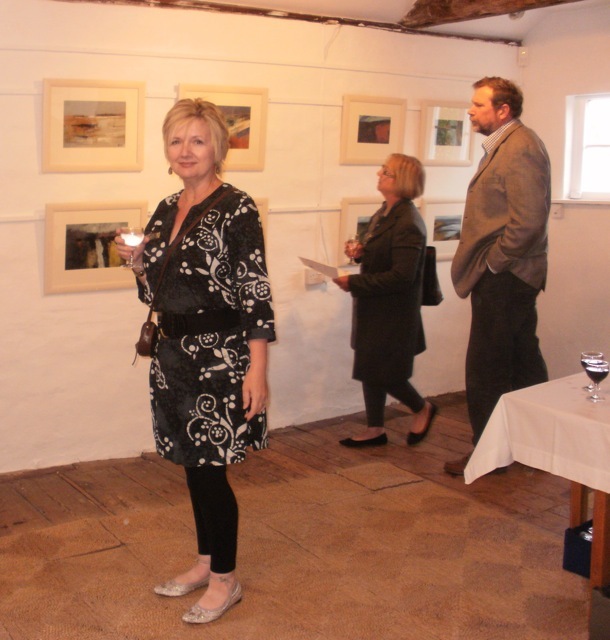 I’m really pleased to be showing at this gallery – not only is it a long- established venue, showing work from established artists such as sculptor Elizabeth Frink and painter Mary Fedden, since 1966, but it is also a beautiful space – medieval, atmospheric, – and its ancient walls and timbers work with contemporary art surprisingly well. It is also a non-profit making charity, run by artists. 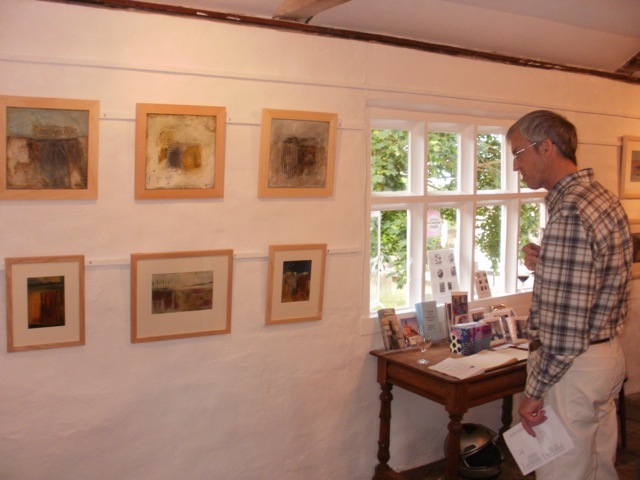 The general consensus seemed to be that the work of the six artists, while varied, sits very well together – thanks largely to the friendly and supportive staff – Alan and Jan who helped hang the show, and Paul Cope who worked so hard behind the scenes on the publicity. My own work filled one wall opposite that of Anthea Eames who uses the materials of the earth itself – a fabulous deep blue from Norfolk woad, Australian red earth, Suffolk chalk etc – to create her striking abstract landscapes. I also love Jazz Green’s square pieces – from the tiny ‘i-cons’ which quietly draw you in, to her large works which seem to hum with restricted but singing depth of colour. 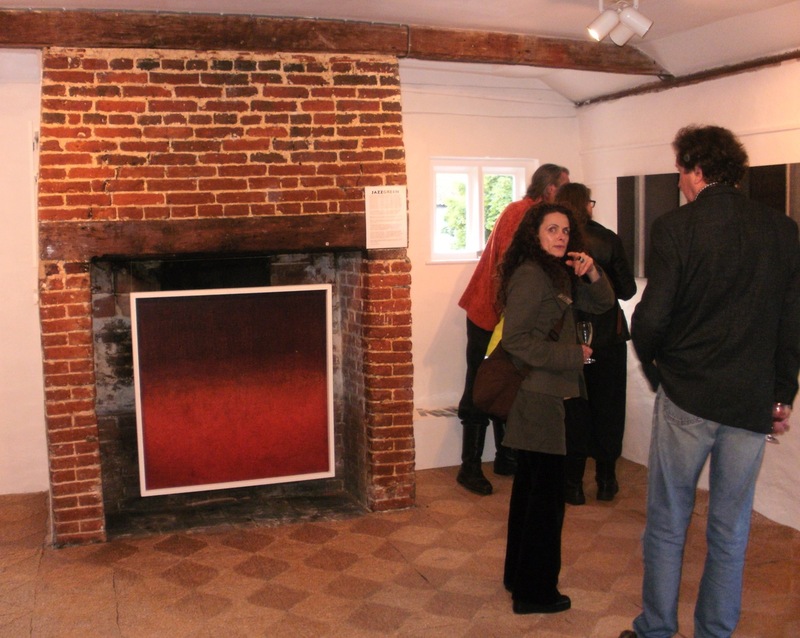 For a more in-depth blog on the same show, with more photos showing all the artists work (which I didn’t manage to get on the night), I can recommend Jazz Green’s blog post ‘six abstract artist – a private view’. This entry was posted in Uncategorized and tagged abstract, Anthea Eames, art, artists, exhibition, Geraldine Carratu, Halesworth, Halesworth Gallery, Jazz Green, Joan Hickson, John Midgley, medieval, mixed-media, non-profit making, painting, preview, show, Suffolk, venue by mari french. Bookmark the permalink. It all looks terrific and I really enjoyed the linked review – well done Mari! Thank you Elaine. I thought the link would be a good idea as Jazz writes her blog posts really well I think, and it’s a way of getting a rounded view of it as it were. hi mari – thank you very much for the link – i have linked back. love how you’ve described my work here – thank you! great to see some photos of the preview too. You’re welcome Jazz. Glad you like the description as I’m not used to writing about art – just wrote how it made me feel really, and thanks for the link back too. how nice to be part of such a great group exhibition, well done. What a lovely place for an exhibition – and what you are wearing, well what can I say? You look really relaxed Mari and hope its all going swimmingly!